Looking for that perfect show to do with the kids over summer or winter break? 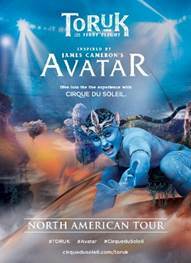 The first Cirque du Soleil show, written specifically for Broadway, just might be the answer. 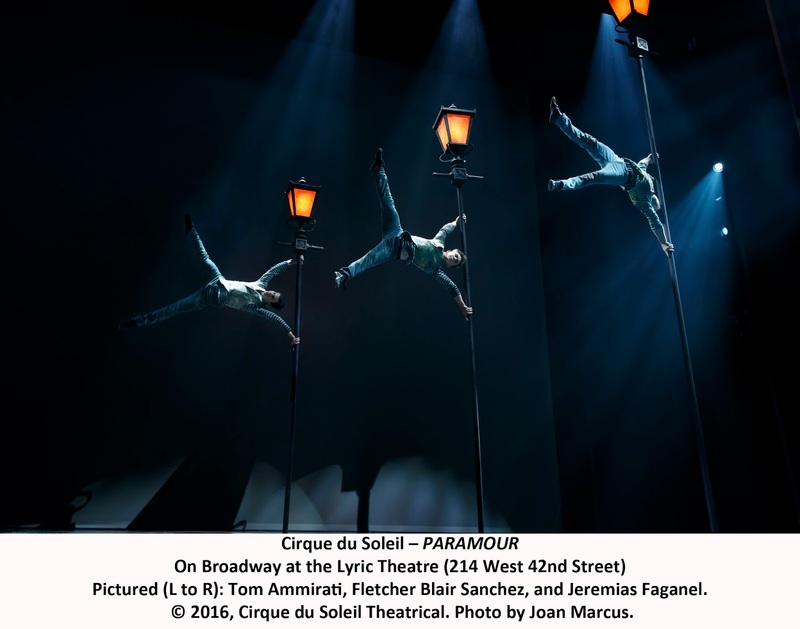 Paramour officially opens the 2016-2017 Broadway season at high-flying Spider-man’s home, the now newly named Lyric Theatre, for which the show’s creators design it, with a tale of a love triangle during Hollywood’s golden age. Ruby Lewis stars as Indigo, an actress caught between her egotistical director Jeremy Kushnier and true love Joey (Ryan Vona) – and that is more of the plot than I usually can convey from other Cirque du Soleil shows which leave the audience gasping at the physical feats being performed but usually scratching their heads in puzzlement over what the story was about. 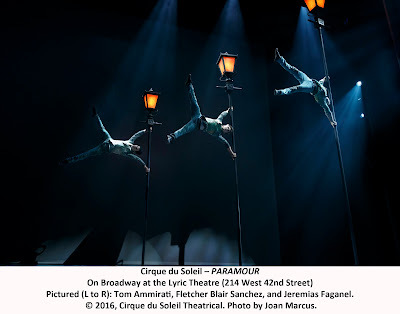 Like most Cirque shows, there is music (composed here by the team of Bob and Bill) and a bunch of circus and acrobatic acts interwoven between the tunes and the plot. The cursory love story (will Ruby choose her career or true love?) moves along, sometimes in an overblown fashion, because of lots of set design by Jean Rabasse. An exception is a terrific trapeze act where their story is acted out. This plot is way better, by the way, than Cirque’s last attempt to play a New York theater a few seasons ago with the really terrible Banana Shpeel up at the Beacon in Harlem. The most breath-taking act is a high-flying strap act featuring twin brothers – all to the backdrop of the filming of Cleopatra. This is definitely the Big Top taking Broadway by storm. It brought its audience -- whooping, whistling and talking – with it, but it is great to see kids experiencing a show on Broadway. If Broadway (and its ticket prices) isn't for you, you still can enjoy Cirque du Soleil in a couple of its Off-Broadway homes this summer. Toruk—The First Flight, inspired by the movie “Avatar” plays Sept. 7-11 at Barclays Center in Brooklyn and form Sept. 15-18 at the Prudential Center in Newark. 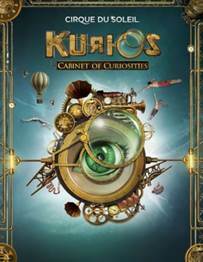 Kurios – Cabinet of Curiosities is a period fantasy about a world where everything is possible. It begins a run under the bog top on Randall’s Island Sept. 29. Paramour runs through Feb. 19, 2017 at the Lyric Theatre, 213 West 42nd St., NYC. Performances are Monday, Wednesday, Thursday at 7:30 pm; Friday at 8 pm; Saturday at 3 and 8 pm; Sunday at 3 and 7 pm. 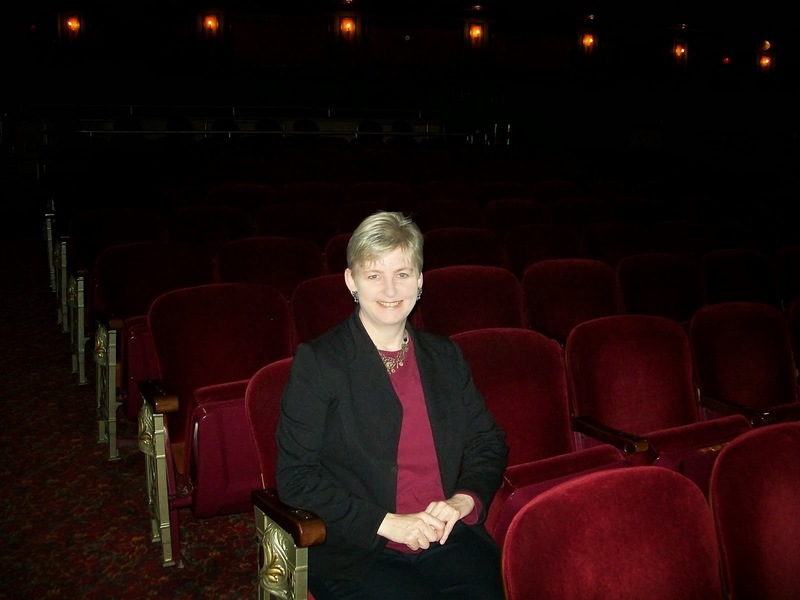 Tickets are $55- $145: www.ParamourOnBroadway.com (877) 250-2929. Credits: Creative Guidance and Direction by Jean-Francoise Bouchard; Direction and Concept by Philippe Decouflé; Associate Creative Direction by Pascale Henrot; Associate Creative Director, Scene Direction and Story by Wes Hyler; Associate Creative Direction, Scene Direction and Story by Scott Zeigler; Set Design by Jean Rabasse ; Costume Design by Philippe Guillotel ; Choreography by Daphné Mauger ; Lighting Design by Patrice Besombes ; Props Design by Anne‐Séguin Poirier ; Projection Design by Olivier Simola, Sound Design by John Shivers and Christophe Waksmann, Associate Creative Direction, Acrobatic Design and Choreography by Shana Caroll; Composition by Bob and Bill (Guy Dubuc and Marc Lessard); Lyrics and Composition by Andreas Carlsson; Acrobatic Performance Design by Boris Verkhovsky, Flying Machine Design and Choreography by Raffaello D'Andrea/Verity Studios, Boris Verkhovsky, Rigging and Acrobatic Equipment Design by Pierre Masse, Makeup Design by Nathalie Gagné , Hair Design by Josh Marquette; Music Direction and Conducting by Seth Stachowski. This play by J.T. Rogers has transferred to Broadway at the Vivian Beaumont Theater and has received Outer Critics and Drama Desk nominations. Below is the review for the Off-Broadway production, also at Lincoln Center. 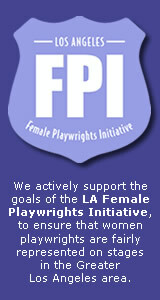 The play seems at home in its larger space. It's still a bit too long in my opinion, but the ensemble is so good it's hard to lose interest. The topic is at once fascinating -- most everybody in the audience is unaware of these behind-the-scene negotiations that were the catalyst for the Oslo Peace Accords -- and relevant. In times when hatred makes it impossible to have civil discourse on just about any subject, the idea that people who have been enemies for thousands of years could sit down and talk as friends is refreshing. Oslo tells the true, but until now, untold story of how one young couple, Norwegian diplomat Mona Juul (Jennifer Ehle) and her husband social scientist Terje Rød-Larsen (Jefferson Mays), planned and orchestrated top-secret, high-level meetings between the State of Israel and the Palestine Liberation Organization, which culminated in the signing of the historic 1993 Oslo Accords. 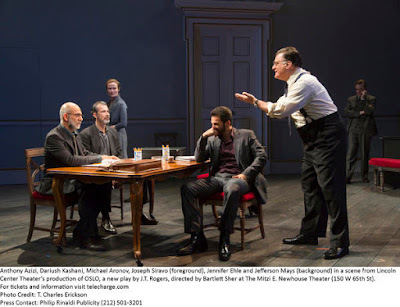 The original Off-Broadway cast of OSLO returns: Joining Ehle and Mays are Michael Aronov, Anthony Azizi, Adam Dannheisser, Daniel Jenkins, Dariush Kashani, Jeb Kreager, Christopher McHale, Daniel Oreskes, Angela Pierce, Henny Russell, Joseph Siravo, T. Ryder Smith, Stephen Schnetzer. 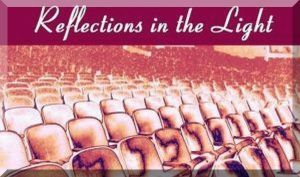 Sets by Michael Yeargan, costumes by Catherine Zuber, lighting by Donald Holder, sound by Peter John Still and Marc Salzberg, and projections by 59 Productions. Don’t let what sounds like a boring premise – the 1993 Oslo Peace Accords – or the three-hour run time scare you away from Oslo the new J.T. Rogers play getting an Off-Broadway run at Lincoln Center. Despite the fact that it could use a substantial edit (unless your name is Eugene O’Neill or Tracy Letts, your play doesn’t need three acts or two intermissions), this story of how the leaders of Israel and the Palestine Liberation Army ended up shaking hands on the White House lawn is engrossing and entertaining. Bartlett Sher directs the large ensemble and keeps us from getting confused, even though there is some doubling in the mostly male cast. The truth is there was a huge cast of characters behind the scenes of the historic peace agreement and while President Bill Clinton probably enjoyed getting a lot of the credit, truth is the accords were thanks to a lot of secret meetings and negotiations headed up by a husband and wife in Oslo, Norway. Mona Juul (an excellent Jennifer Ehle) is a well respected official in the Norwegian foreign ministry and reports to Jan Egland, the deputy foreign minister. 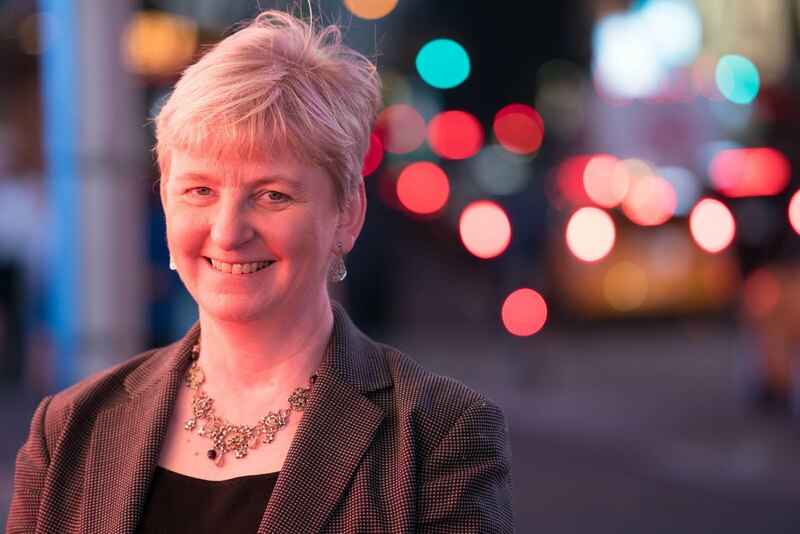 She and her husband, Terje Rød-Larsen (Jefferson Mays), the director of Fafo Institute for the Applied Sciences, realize they might have come up with a way for the two sides to begin talks. It will be tricky – it is illegal for Israeli government officials to meet with members of the PLO and Foreign Minister Johan Jorgen Holst (T. Ryder Smith) is vehemently opposed to the idea. But if they can just find a way to get the right people together in an unofficial way, they might get the ball rolling…. Enter Ron Pundak (Daniel Jenkins), a junior economics professor at the University of Haifa who is able to make initial contact. The negotiations begin with some lower ranking officials at the Borregaard Estate outside of Oslo, where Mona and Terje acts as hosts and the housekeeper and cook (Henny Russell) keeps everyone happy with waffles (Rogers interlaces a lot of humor in the script to balance the complexity of the dialogue). Soon, negotiations are going so well that the big players are brought in for both sides. Hassan Asfour (Dariush Kashani), the official PLO Liaison at the US talks which are going absolutely nowhere; Ahmed Qurie (Anthony Azizi), the PLO’s finance minister; Uri Savir (Michael Aronov), director general of the Foreign Ministry; Yossi Beilin (Adam Dannheisser), deputy foreign minister; and Shimon Peres, foreign minister, hash out the differences between their nations and the steps toward peace. All the negotiations take place behind closed doors, but they break, out in the parlor with Toril’s waffles, they become friends, sharing jokes and telling stories about their families. Things get tense when Terje oversteps his authority and begins acting as a negotiator, making promises and telling lies to keep the negotiations moving forward, but which in reality, could bring the whole process to a grinding halt. The action takes us through about nine months and to various locations, all on one set designed by Michael Yeargan with cushioned benches circling the stage area on the floor. An architectural embellishment over the door at the rear where the men venture for their discussions is a reminder of the grand house they are in and of the importance of the negotiations taking place. The parlor room becomes like a family room as the friendships develop even while personalities clash. The three-hours certainly could be reduced – perhaps by about 45 minutes (especially if that second intermission could be eliminated). While this usually would signify a weak play to me, that is not the case here. All the action and information as written is interesting, well written and directed. There’s simply too much material and as a result people were nodding off and missing a pretty decent play. Take a nap first (or opt for a matinee instead of an 8 pm curtain time) and go. You’ll see the Oslo Accords in a whole new light. Lighting Design by Donald Holder, Sound Design by Peter John Still, Projection Design by 59 Productions. Just throw out reality for about two hours and 15 minutes and you’ll be able to enjoy four actresses having a lot of fun on stage in Israel Horovitz’s bizarre comedy Out of the Mouths of Babes getting an extended Off-Broadway run at the Cherry Lane Theatre in Greenwich Village. 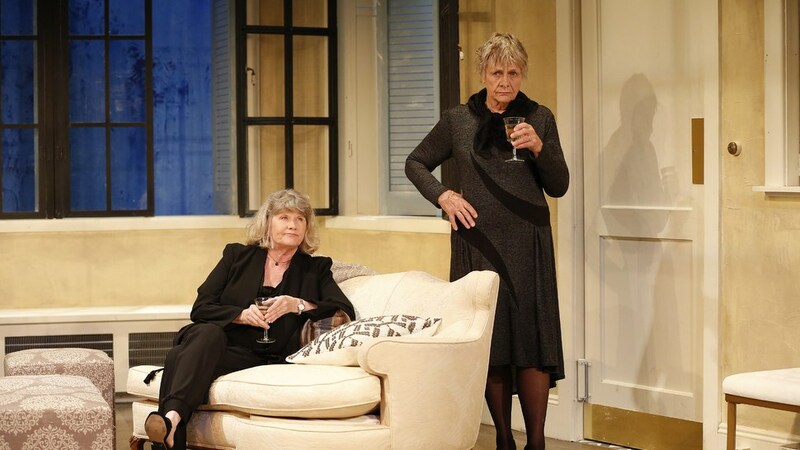 Headlining are two theater legends, Estelle Parsons, who has five Tony award nominations (the latest for her compelling performance in Velocity of Autumn) and an Oscar under her belt, and Judith Ivey, a Tony winner and multiple nominee too. They play two of the ex lovers/wives who show up in Paris for the funeral of the man they once loved. Evelyn (Parsons), the second wife, lets herself into her former apartment (designed by Neil Patel) with its lofty ceilings and walls full of artwork only to be joined by his former lover, Evvie (Ivey) whom the man saw during his marriage to Evelyn. If that isn’t enough awkwardness to go around, they soon are joined by two others: another wife, Janice (Angelina Fiordellisi), who once tried to commit suicide by jumping out of one of the large windows overlooking the canal when she learned of the man’s infidelity to her, and Marie-Belle (Francesca Choy-Kee) who is the current occupant of the apartment, and who apparently still is receiving visits from her lover – the man they all adored -- in ghostly form. Again, I stress that the plot is off-the-charts ridiculous, with the women joining together to keep Janice from taking the plunge again and listening as Janice and her tickle-happy ghost lover get it on in the other room. They say some very repetitive dialogue in a mediocre script that appears to have been written just to allow characters to say certain lines. A lot of those lines are pretty funny, but I am not sure they all would be without these amazing actresses saying them. Parsons and Ivey seem to get laughter from lines that aren’t really funny too, just by the way they deliver them. The multi-generations represented by the four women tell us that the deceased spent most of his 100 years collecting women. And despite his infidelity, they all seem to still be carrying a torch for him. Marie-Belle, the youngest and hippest of them all, is totally without any jealousy and proposes that the women all share the apartment in a sort of living tribute to him…. So the subject matter isn’t exactly what we hope for when it comes to finally having a play on stage that has four female characters, and several more mature ones to boot. They are all professionals in some way – Evelyn was a journalist, Evvie is a Hollywood screenwriter and Janice is an academic, but all these women seem to be able to do is fawn over their former lover who doesn’t sound like he was such a great guy…. Getting to see Parsons and Ivey interact makes it worthwhile, however. It also is nice to see Fiordellisi, celebrating her 20th year as Cherry Lane’s producing artistic director, get a turn on stage too (she goes back on Broadway to Zorba). I’d love to see them all in a play with something worth their acting abilities. The combination of bizarre plot and male worship seems to work because of the engaging actresses cast by Director Barnet Kellman. There also is a surprise visit by a guest not credited in the Playbill. The show has been extended through July 31. Out of the Mouths of Babes plays through July 31 at the Cherry Lane Theatre, 38 Commerce St., NYC. Performances are Wednesday and Saturday at 3 and 7 pm; Thursday and Friday at 7 pm; and Sunday at 3 pm. Tickets $66-$96: www.cherrylanetheatre.org; 866-811-4111. Costume Design by Joseph G. Aulisi , Lighting Design by Paul Miller, Sound Design by Leon Rothenberg.